Small Investment In A Dream. The Mystery of the Nib is Solved! In the meantime, I enjoy watching Bob Easton build his Fiddlehead. 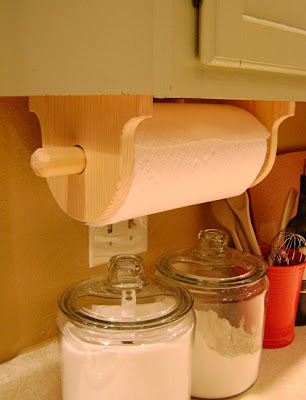 In part one I discussed the design, layout and cutting of the brackets for this simple paper towel holder. Now let's look at how I finished the project. 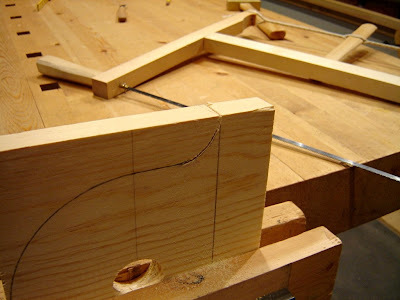 After cutting and shaping the second bracket, using the first as a pattern, I started on the base. Because of the way this holder is mounted under the cabinet (the cabinet bottom is actually recessed) the base will not be readily visible. So nothing fancy here - just a board with two dados to hold the brackets. 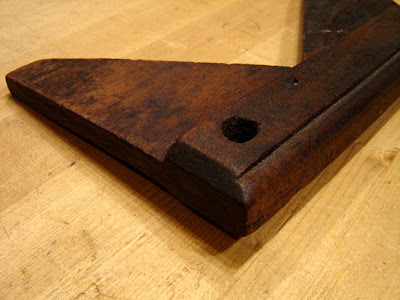 Dados are like grooves, except they run cross grain, while grooves run parallel to the grain. There are many ways of making these by hand. I decide to do a side-by-side (literally) comparison of two of these ways: knife, chisel, and router plane; and dado plane. After laying out the dado with the square and marking knife, I used the router plane to mark the final depth of the dado. 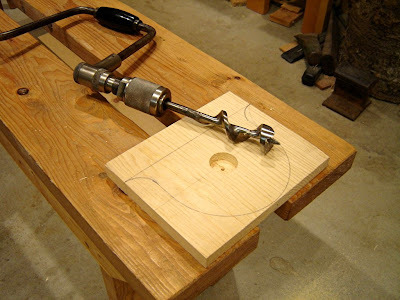 Of course, you could do this with a marking gauge etc. but I find this a convenient shortcut. The next step is just zipping out the waste with the chisel. 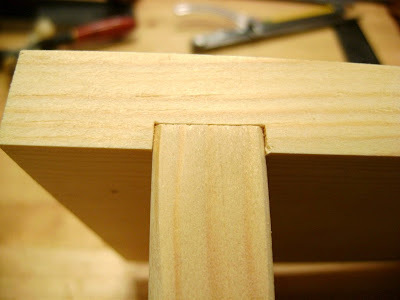 As shown, I started with the chisel bevel up, and then switched to bevel down action. There are two things to watch out for here. First, you need to be careful to avoid tearout on the far edge of the board. I do this by either cutting a small ramp with knife and chisel, or avoiding the issue entirely by working in from both edges. 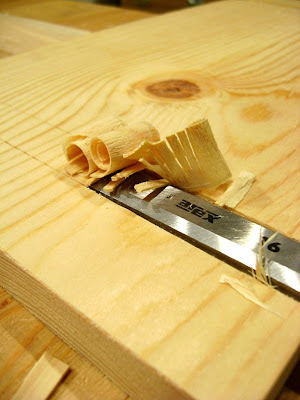 You also need to be careful to keep the chisel (and your arms and body) moving in a straight line. 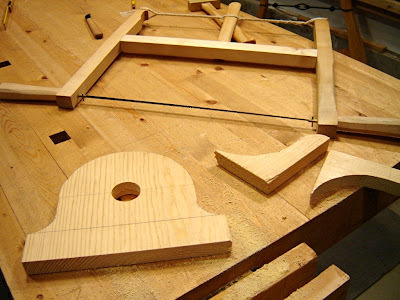 If you pivot or arch your stroke to either side, the chisel will dig into the sides of the dado and cause tearout. I find short, almost "jabby" strokes work better than long smooth ones in most cases - which somehow seems counterintuitive... Also, the knife lines will need to be redone as the dado deepens. 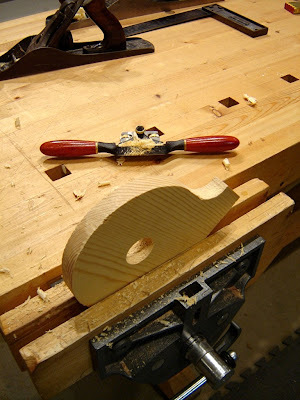 After getting close with the chisel, I switched to the router plane to clean things up and insure a flat, level bottom. I prefer the spear point cutter, but a square one works too. For the second dado, I used a tool made specifically for the job. 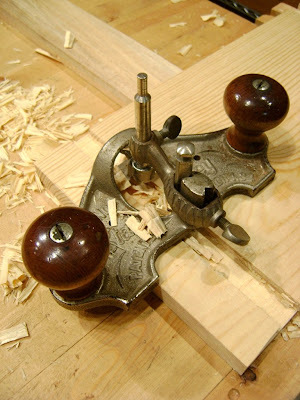 The dado plane combines the abilities of all the tools used on the first dado. It has dual nickers that knife the cross grain fibers to avoid tearout. 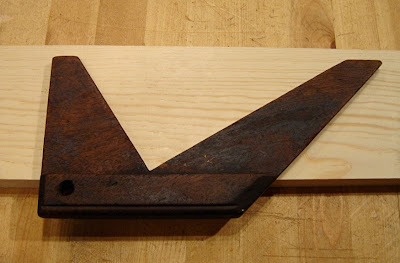 It has a skewed iron that cleanly removes the wood between the knifed lines. And it has an adjustable depth stop to create a smooth and level bottom in the dado. All the assistance it requires is a small batten attached to the board to guide it. Since I knew that the holes wouldn't show, I just nailed the batten to the board. If you wanted to avoid that, you could clamp it. 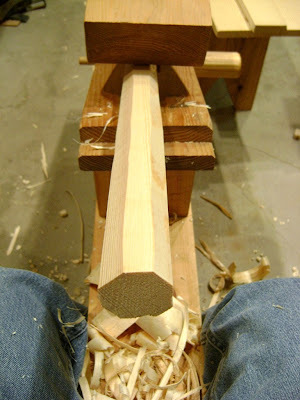 Once the batten was in place, it was easy to plane the dado. 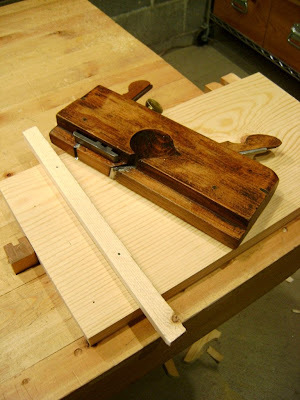 Both methods worked fine, but using the dado plane was easier (once it was properly adjusted) and produced a cleaner dado. Here's a shot of the test fit and a close-up of the dado joint made with the plane. 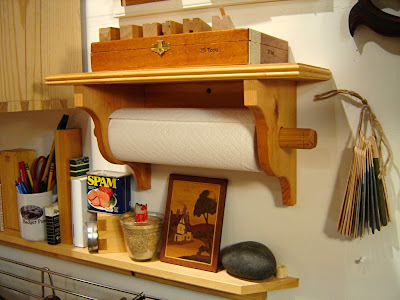 Once the brackets were nailed and glued into the dados, it was time to work on the rod that actually holds the roll of towels. I selected a piece of 2x stock with straight grain and using a hatchet and maul, split off a section. 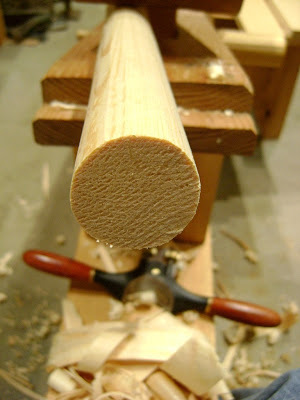 ...and finally, using a concave spokeshave, changed this into a cylindrical rod. After rounding the rod ends by cutting facets with the drawknife, it was time to hang the finished holder from the bottom of the cabinet. A huge improvement in my opinion. Where before I managed to avoid noticing the junky plastic holder, I now enjoy noticing and appreciating the new wooden holder. Sometimes small things are big changes. Here's the hand tool kit used on this project. Rip saw, concave spokeshave, #6 fore plane, flat spokeshave, shoulder plane, #5 jack plane, #3 smoothing plane, cross-cut panel saw, ¾” dado plane, #71 router plane, fine and coarse half-round files, 14” Brace with #20 bit, hatchet, batten, ¾” bevel edged chisel, awl, nail set, hammer, drawknife, square, marking knife, zigzag rule, plane setting hammer, and compass w/ pencil. You know how some things just hide right in front of you? You look at them every day, but somehow you don't really see them. And then, one day, BAM! "Where did THAT come from?" That was our kitchen paper towel holder. For years, it's been there. I get paper towels from it every single day. But when I finally "saw" it - Yuck! It's awful. Dingy. Shoddy. Plastic. How could I have let that thing stay in my kitchen? It's all the more shameful when compared to my shop paper towel holder. Which, although simple in design and construction, I do notice every time I get a towel from it. It's wood. I made it. It makes me happy. Big, big difference. First, I created a new design based on my shop holder, but with modifications made for mounting it under the cabinet, rather than on the wall. Then I figured out how much wood it required, and the dimensions of the stock. 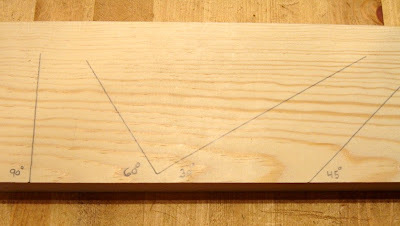 After crosscutting a pine 1x12 to rough length, I used my panel gauge to mark the width for ripping. 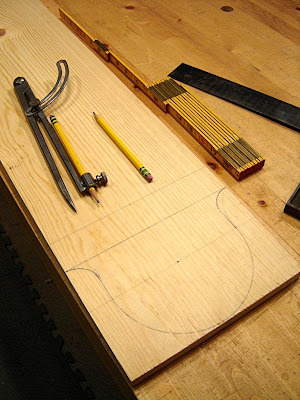 After a quick trip to the saw bench, and a few passes of a fore plane, it was time for layout. I used pencil so I could make changes as I went. After the third redo, I liked what I saw. 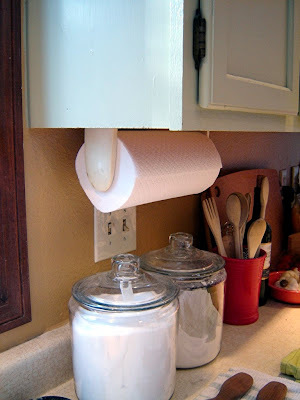 The next step was to bore the hole for the rod that will hold the paper towels. I do most of my boring on my low saw bench. 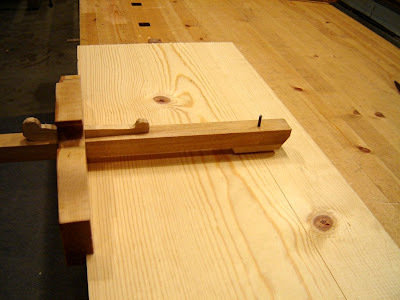 The slot down the length of the bench makes supporting the workpiece easy. For the boring, I used my Stanley "Yankee" clone, 12" sweep with a 1 1/4" (marked "20" - as auger bits are numbered in 1/16ths) auger bit. The bigger sweep gives me much more torque. Even in the soft pine, a bit that size has quite a lot of resistance, and although a brace with a shorter sweep would function fine, less effort equals smoother action and less likelihood of tearout on the face from wobble. The trick to avoiding tearout on the back is to not bore all the way through. As soon as the lead screw breaks through on the other side stop and flip the board. You can reach under to feel for the tip, but after some practice you can just feel it in the brace when the tip breaks free. It's pretty amazing, but that tip can just barely be felt with your finger tip, barely even be seen, but the tool and your body will tell you, if you are listening. After you flip the board, place the lead screw in the tiny hole and bore in from the back side. 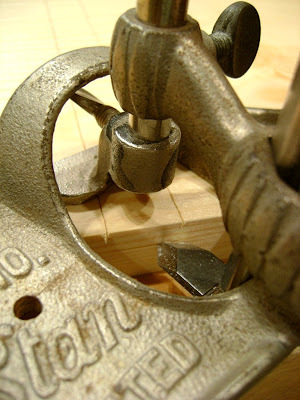 As the screw has nothing to hold onto, you have to apply more pressure to keep the bit cutting. This is where having the low bench really pays off. I just lean over the work, put the back of my top hand on my chest and bear down on the brace, letting my weight do the work. Side Note: If you don't have a bit this big, expandable bits are useful, but the flipping technique above doesn't really work. Because expandable bits tend to have only one cutting fluke, they don't rotate cleanly once the bit looses the guidance of the lead screw. In this situation, your best approach is to use a piece of scrap wood as a backer and just bore straight through from the front side. I used to put a piece of paper between the two boards to show me when I was completely through (just like a lot of old shop instruction books tell you), but you don't need too. If you pay attention, you can feel the brace tell you when you are in the second piece of wood. It's pretty cool. Once the hole was finished it was time for roughing out the shape with my bowsaw. I like to cut with the grain when I can, so I cut and rotate often. Next I will use this piece to layout the duplicate bracket for the other end. 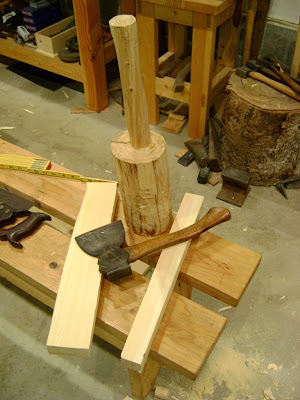 Then I will need to cut a piece for the top, cut two dadoes in the top, make the rod, attach the brackets to the top and mount the holder under the cabinet. Soon that plastic piece of junk will no longer be hanging in our kitchen. Which is good, because now that I have noticed it, it mocks me unmercifully every chance it gets. 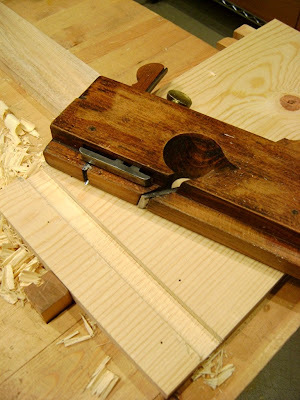 When I got up this morning, I had no idea that in the course of my normal day I would stumble upon the definitive answer to one of woodworking's most puzzling conundrums. But that is exactly what happened! That's right, without even meaning to, I have found the solution to the eternal question: "What is the purpose of the nib on old handsaws?" 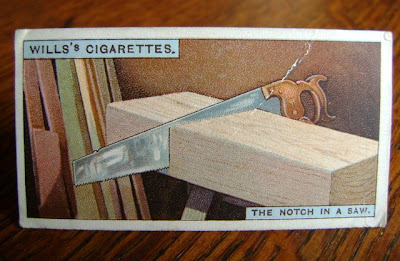 Who knew that the solution was thoughtfully provided over 80 years ago by a helpful manufacturer of cigarettes? I didn't. And truthfully, I almost missed it today, all because of a slight linguistic twist (or Queen's English) that replaces the term "nib" with "notch". "I'm not a collector - I'm a user." I find myself saying that often - and more frequently - as my, well, collection, of tools has grown. And it is true - mostly. Of course, I could accomplish most of my woodworking projects with a much smaller set of tools, but that doesn't mean I'm a collector. But there are some tools in my shop that I don't use (or rarely use), that I didn't need when I bought them - and it's these tools that push me over the line into the domain of the collector. Here's an example. 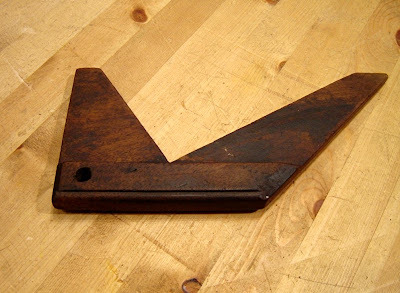 Skimming through the usual boxes of dull files, broken screwdrivers, and paint scrapers that somehow qualify the store to fly an "Antiques" flag, I found this old bevel gauge. It was obvious from first glance that it was in a whole other class from the junk that mostly obscured it from view. This was a shop made tool - made by the person who used it, and made well. 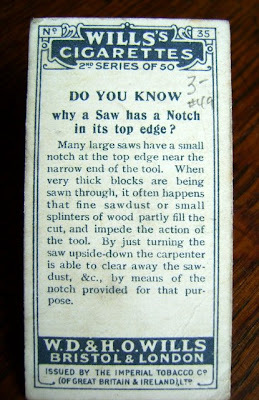 A craftsman's tool. I'm not sure of the wood - I was thinking it was walnut, but now I think it could be mahogany. I'm not very good at identifying wood as I work mostly in pine, Douglas fir, and Alaskan spruce and birch. The gauge is one piece, with the blades sawn and planed down from the fence. This alone tells me volumes about its creator. Much more than a simple nailed on fence, this design took skill and a desire for quality to create. With the fence on the edge of a board, four angles are available for marking. From left to right: 90°, 60°, 30°, and 45°. The gauge is well made, but not ostentatious. The fence has a small amount of decoration, consisting of a thumbnail moulded edge and a bevel at each end, both of which serve practical purposes as well as begin aesthetically pleasing. The thumbnail eases the edges of the fence where your palm meets them, while the end bevels reduce the chance of chipping. I also like the idea of the hang hole. To today's sensibilities it seems wrong, damaging. But to the maker/user of this tool, it was just the practical thing to do. So, although I didn't need it (my sliding bevel gauges work just fine), and despite a fairly major crack in one blade, I just couldn't leave it mixed in with the machine made junk in the box. I fished it out, bought it and now it sits in the shop. I occasionally pick it up, wipe on a little linseed oil left over from some project, and admire the sensibility and craftsmanship that went into this little tool. And rarely, very rarely, I'll gently use it on some project - but not too often, because it's really not one of my user tools - its part of my collection. "Hi, my name is Dan - and I collect old tools. Sometimes." Books Are Like Clamps - You Can Never Have Too Many! 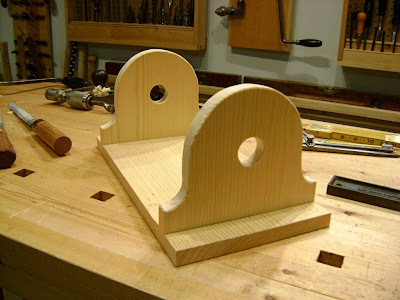 A recent post about "Top Ten" woodworking books on the Village Carpenter got me thinking, and digging through my library trying to come up with my list. In the process, I discovered I was a little out of date on my List-O-Books. The official count is now over two hundred books! "How to start with a tree and an axe and make one thing after another until you have a house and everything in it." If I had to pick just one of Roy's books, I think it would be this one. It has everything I love about his writing: deep knowledge, excellent writing, history, culture, humor, and a strong sense of the interconnectedness of everything. But really, ALL his books are "Top Ten" material. One of the first hand tool woodworking books I read. The information is great (it has a few quirks)and his pencil illustrations are fantastic! For an added bonus, you can have fun trying to find the names, or initials, of the people listed on the acknowledgement page hidden in the illustrations throughout the book. 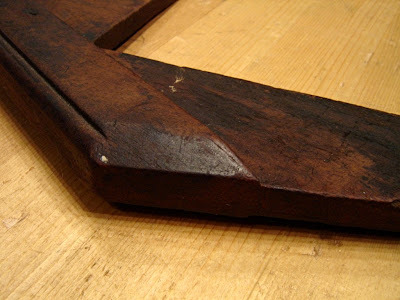 A fascinating, detailed guide to hand tools and their use. It makes a good companion book to Watson's Hand Tools, especially since it covers moulding planes, something Watson left out. A great book focusing on the fading (or vanished, it was published in 1974) connection between man and his environment, with a focus on architecture, agriculture, boat building and various other crafts. It examines the impact of machine technology replacing direct craftsman/environment interaction. A serious, almost academic in a philosophical way, discussion on, well, art and workmanship. If you are serious about craftsmanship, you need to read this book. It is kind of a highbrow cousin to the more folksy Craftsmen of Necessity. 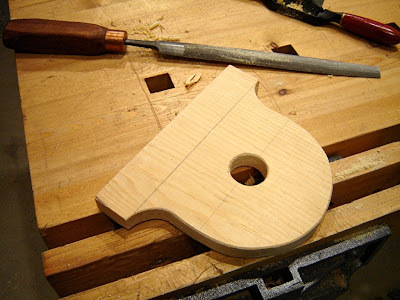 Solid hand tool information and truly inspirational photos of kids and their projects. I wish I had access to a teacher like Starr when I was a kid. This is one of those books I keep going back to. 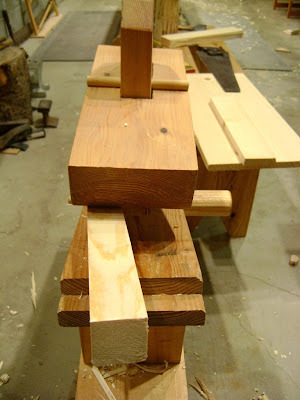 I love poring over the photographs of woodworker's shops. 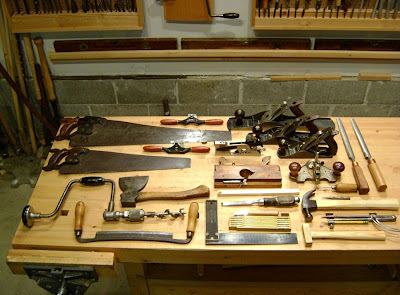 I like trying to identify the tools in the background, spot interesting storage ideas, and just trying to learn as much as possible about the craftsman by looking at his space. I always notice something new. If you are interested in old American planes, their makers, and their place in history, then this is the book. It is written more for the collector, than the user, but it's the first place I go when I'm seeking information about the moulding plane I'm about to put back to work. A solid "How To" hand tool book, mixed with subtle sales pitches, campy illustrations, and a surprising amount of philosophy. For a more complete discussion see my post Your Boy Is Safe When He Is Working With Tools And Wood.